Brock Boeser scored twice and Daniel Sedin inched closer to a major NHL milestone, leading the Vancouver Canucks to a 5-2 win over the slumping Philadelphia Flyers on Tuesday night. Last summer, following the Vancouver Canucks' development camp, coach Travis Green sat down with rookie right wing Brock Boeser and, in no uncertain terms, told him it was time for him to prove he could be an impact player in the NHL. "Travis gave me a serious talk and told me what I needed to do to make the team and make a difference," Boeser said Tuesday night after scoring two goals to lead the Canucks to a 5-2 win over the slumping Philadelphia Flyers. "I knew it all depended on how hard I worked and so far, it's been going pretty well." Boeser leads the team in goals (nine) and points (19). He's one point behind NHL rookie scoring leader Clayton Keller of the Arizona Coyotes. "We talked about his game," Green said after the Canucks improved to 10-8-3. "We talked about expectations and where he was at. I'm happy with his game. It's not just his goal scoring that I like. It's his detail away from the puck, being able to win puck battles, his conditioning. All that. It's part of being a pro." Meanwhile, teammate Daniel Sedin inched closer to a major NHL milestone, picking up a goal and an assist to leave him four points shy of 1,000 for his career. Sven Baertschi scored a power-play goal, Henrik Sedin had two assists and Loui Eriksson added an empty-net goal and an assist for the Canucks. Jacob Markstrom made 35 saves to earn his sixth win of the season as Vancouver won for only the second time in six games. Ivan Provorov and Jakub Voracek scored for the Flyers, who lost their fifth straight and fell below .500 (8-9-4) for the first time this season. "We have to find a way to break these habits," said Flyers right wing Wayne Simmonds, who has gone 13 games without a goal after scoring six in his first eight games. "We have to find a way to get a win here, no matter what it takes." Michal Neuvirth took the loss, allowing four goals on 22 shots. He was replaced by Brian Elliott with 5:20 remaining in the second period. "Fairly or unfairly, somewhere we need a save from our goaltender," Flyers coach Dave Hakstol said. "That one is on me. I should have done that after the third goal. Once it gets to 4-1 it's hard to dig out of that hole." The Canucks entered ranked 27th in the NHL in goals and 24th on the power play. They scored five goals for just the third time this season and went 2 for 4 on the power play. 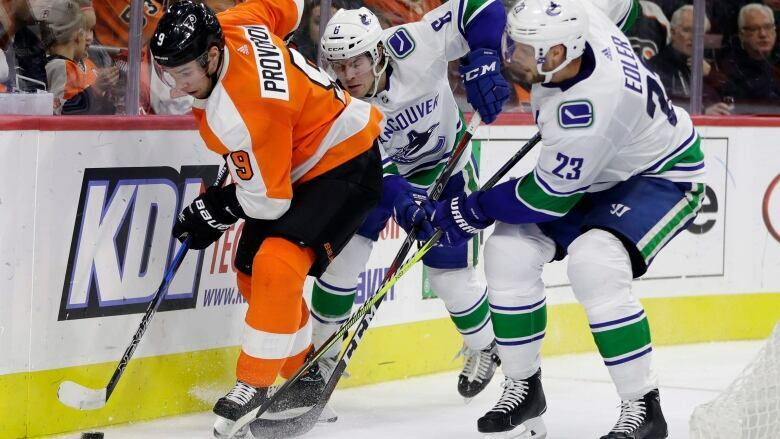 The Flyers opened the scoring when Provorov's shot from the left point redirected off the shoulder of Canucks defenceman Alex Biega and past Markstrom. The goal was Provorov's second in two games after going nine games without one. Daniel Sedin tied the score less than two minutes later when he beat Neuvirth off the back of his pad on a breakaway for his fourth goal of the season. Boeser gave the Canucks a 2-1 lead midway through the period with his eighth goal when he converted a feed from Derrick Pouliot, then made it 3-1 less than two minutes into the middle period with his second power-play goal of the season. Baertschi made it 4-1 with the Canucks' second power-play goal of the night, sending Neuvirth to the bench in favour of Elliott. The Flyers closed to 4-2 with 10:04 remaining in the final period when Voracek scored his sixth of the season, but Markstrom was solid the rest of the way and Eriksson scored an empty-netter to seal it.